A fast red car or nursing degree in my middle age? I decided on my long held dream of the nursing degree. So now, I’m part of a team of extraordinary professionals who remind me every day that flagging the fast car was the right decision. I love my job, I love and respect the people I work with and I care passionately about those I am charged to care for. But, every day it’s getting harder. Harder to care the way I want to, the way I know I should and to care to the standard that my job description and Nursing Council expect of me. This sounds emotive – it’s meant to be! Last time I looked I’d signed up for the ‘caring profession’, I’m paid to care – not to short change my patients. I didn’t for one moment, while studying, consider that I would have to factor ‘care rationing’ into my day. Care and rationing don’t even belong in the same sentence – It messes with a nurse’s head, it shouldn’t even be a concept!! If the Minister of Health, Dr Coleman is going to name and shame hospitals who fail to meet the ‘ED Six Hour Target’, then he should be obliged to give the public the full story – the reasons why this is happening in the first place! Perhaps explaining that some EDs have increasing, unprecedented presentations – some patients very unwell, needing massive resource input, so others sit for hours waiting to be seen because there aren’t enough nurses or medical staff to keep the patient flow going. Or maybe that the hospital is in ‘bed lock’ – not a single bed, until hurried discharges are made – a short term solution, because some of those patients will be back in ED, sicker- requiring a higher level of care and another admission. Or maybe that some days ED waiting rooms are full of patients who could have gone to their GP, but have left it too late, or couldn’t get an appointment, or didn’t have the money. Nurses were voted the ‘most respected profession’ survey this year. I don’t feel respected by our government. If the government respected us and our work, they would make sure that nurses had the tools to do their job, and to do it well. Our health service is being stripped so bare, many nurses are walking away or planning to. They’re done with the stress, the shifts that end in tears, not wanting to go back tomorrow. I just want to be able to do my job properly, safely and go home knowing I’ve done a good job. Our health system should be given a realistic budget that allows it to function properly. If we want things to change then it’s up to nurses to say so – nobody else is going to! So do we wait until the next pay round? Do we wait for a nurse to make that error we all dread? Do we keep waiting… for what? It’s time to use the strength of our union to give the public the full story of what is happening to our health system and why that system is letting them down. To say nothing is negligent! Photo credit under Creative Commons licence. Tags: collective action, DHB, funding cuts, health politics, safe staffing | Permalink. 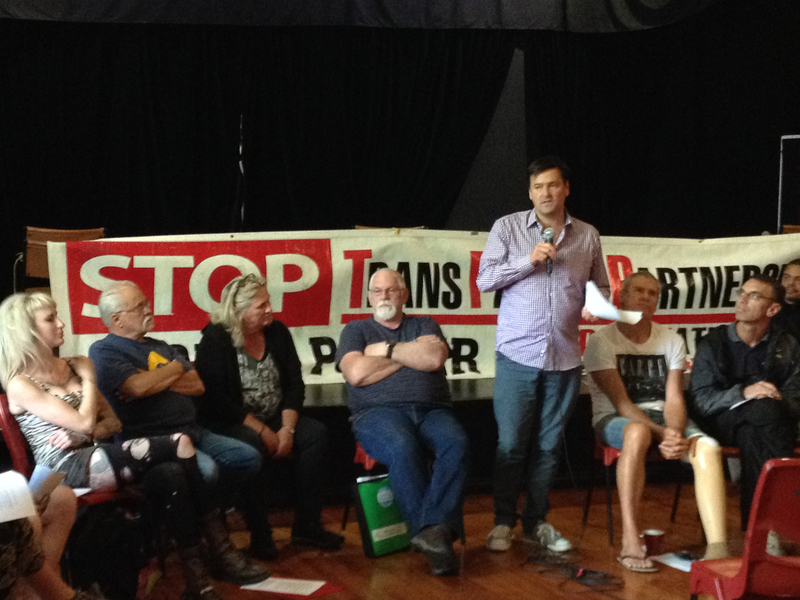 Last week NZNO held its AGM and conference. This year around 300 delegates and college and section members met at the Museum of New Zealand Te Papa Tongarewa to discuss and make decisions about our organisation, nursing and the wider health sector. We learned new skills, to celebrated our successes and took up the challenges that were laid down. Our new elected leaders were welcomed and our our departing leaders were thanked for their mahi. One of the highlights of the AGM and conference were the wonderful speakers, from within NZNO, around the motu and throughout the world. Here is the address given by NZNO chief executive, Memo Musa on the morning of the first day. I am Memo Musa, Chief Executive of NZNO. It gives me great pleasure to welcome you all to NZNO’s 22nd Annual General Meeting. And to our exhibitors and sponsors who are here today and for conference tomorrow, welcome. I know that Marion and Kerri have welcomed you already but it is important that I do so too. This is my second report to the AGM on NZNO’s performance during the past financial year. I hope you have had the opportunity to read our Annual Report 2014/15 and reflect on our operational and financial performance as well as our achievements. I would like to take a few minutes to take you through some of the key highlights of the year. Before I do so, I would like to comment briefly about the AGM today. You will have seen from the information you received that we have a total of seven remits and twelve policy remits. These should provide us today an opportunity to fine tune some aspects of the constitution as well as debate or discuss policy matters that are important to you and require our collective action as an organisation. I accept that it is a democratic process to amend aspects of the constitution. I would like to sound alarm bells that this can equally create a state of inertia as it makes it difficult to work within rules that are continually changing. That said, some improvement are required. We started the year with five priorities. Strong operational management and transparent reporting are critical to the long term success and creation of value. This is why, with support from the Board, during the past two years we have completely revamped the Annual Report to give you more information, detailed highlights, successes and challenges. This provides us an opportunity to celebrate successes and face up to what we could have done better. Often we hear that we do not celebrate or showcase our successes enough. Now the key highlights. I will only pick a few to illustrate key points. The biggest challenge for any member organisation is maintaining membership, let alone increase it. Membership levels have a big impact on the viability and sustainability of NZNO. The solid work you are doing, including the work by our organisers, industrial advisors, professional nurse advisors and other staff through our organising ethos, models and approaches, including our communication, has resulted in us maintaining our membership numbers at above 46,675 based on 2013/14 year with a very modest increase of 103 members to 46,778 members. Our biggest growth was in the registered nurse members were we saw an increase of 918 members from the previous year totalling 35,275. This makes up 72 percent of practicing registered nurses. According to the Nursing Council there are 48,406 registered nurses practicing. However we had challenges with student nurse membership which declined from 4,225 in 2011 to 2,700 by the end of March this year a drop of 36 percent. This a concern we must address. Fellow colleagues, we cannot ‘rest on our laurels’ when it comes to membership, as during the past five years union membership in New Zealand has been in decline. By 2013 it had fallen by 2.0 percent and at the end of March 2014 this had fallen by 1.8 percent. I am waiting for the 2015 figures to be published. My guess is that the same trend will continue. Whilst overall we are doing better than some unions and professional associations we have room to improve. At our AGM last year some of you may recall my report and reflections. I stated that advocacy and lobbying are at the core of what we do to advance the agenda for nursing teams both from an industrial and professional perspective. Being an election year, I observed that on one hand there is a sense that we are not visible, not adversarial or political enough, that we need to be out there and showing leadership on key issues, on the other hand some argue and lament that we are politically biased or in favour of a particular political leaning whilst others say we are negative and adversarial, whilst other say we are doing ok. The profile of our role as a professional association, promoting nurses and the nursing profession is critical to our future existence at the same par as membership. Demonstrating relevance and value add to patient outcomes, healthy families and communities should be the cornerstone or platform upon which we build our profile as an association and by promoting nurses and the nursing profession. I am pleased to report that during the last year we continued to push forward our agenda to promote NZNO, nurses and the nursing profession by increasing our clarity of relevance and value add. On Wednesday 28 August 2013 the main headlines in the Dominion Post read “Nurses ration patient care” “Families pitch in as staff stretched”. This article reported nursing shortages at Wairarapa and Hutt Valley hospitals stating that nurses are ‘rationing’ their care to patients. It referred to essential care being prioritised over patient ‘comfort’ or ‘non-essential’ tasks. There was the usual follow up discussion and debate in the media and between nurse leaders with attention being on nurses’ decisions and actions about patient care when faced with nursing shortages or the wrong skill mix. What was missing in all the dialogue was the fact that in reality it was not nurses rationing care, it the public health system; the way it is funded resulting in not having enough nurses, inadequate time, and the right skill mix to provide complete care. 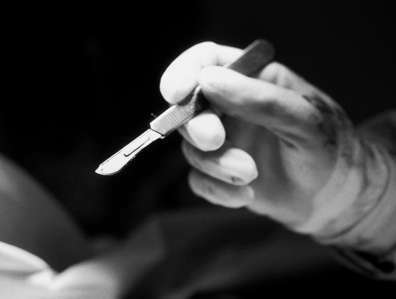 Our policy and research teams, with member input and consultation, developed a position statement on Care Rationing which was presented to all District Health Boards, the Ministry of Health and the Minister of Health. This helped change the dialogue and inform the debate on this very complex area which often is very emotive. You will hear about this more this afternoon. We also embarked on a project to increase the visibility of nurses of which the first phase establish a theme which is “Nurses – Making the Difference in Healthcare”. A website has been set up where nurses can share stories. You can access this through our website under the campaigns banner. The second phase involves identifying and training nurse champions. A third phase to promote and increase the visibility of nursing is yet to commence. You will hear more about this in more detail this afternoon. Another highlight is our work is with the Service and Food Workers Union Ngā Ringa Tota on the campaign for equal pay “All the way for equal pay”. The sterling legal defence work which saw the Court decline Terranova’s leave to appeal on and directing the Employment Court to establish equal pay principles to resolve the equal pay claim. Again we will hear about this in more detail this afternoon. One last key highlight under this section is the work we do to represent members, whether it be through Health and Disability Commissioner investigations, employment related matters, Professional Conduct Committee and Health Practitioner’s Tribunal hearings. Approximately 237 ‘events’ were taken up involving more than about 3000 members. We noticed an upward trend in the request for representation and the number of complaint against nurses which are being made to the Health and Disability Commissioner. We have also noticed an increase in the number of nurses that the Health and Disability Commissioner finds in breach of the Code of Health and Disability Services Consumer Rights. Last year we challenged the Commissioner by asserting that some of the breaches could be at the system level not the individual nurses’, and primarily caused by inadequate funding which leads to poor staffing levels impacting on patient care. We asked him what approach he intended to take to address some the breaches we considered to be at a system level. His response was that his concern was “primarily to assess the quality of health and disability services” and the system issues I had raised were better addressed by District Health and and/or the Ministry of Health’. This I found astounding. Fellow colleagues, I will make no apologies for saying that if we fail to show relevance and to add value it will be to our detriment. Some antagonists might think what we do is ‘all about us’. Clearly that is not true. Promoting the profession of nursing and nursing standards is a key foundation to strive for recognising the mutual interdependency with our industrial focus and that getting the balance right is very critical. I am going to tell you something you already know. Nursing is the biggest workforce in the New Zealand public health and disability system. According to a report on health workforce released by the Ministry of Health and Health Workforce New Zealand in November last year, nursing makes up about 54 percent of the regulated health workforce in New Zealand, based on annual practicing data of all regulated professions. Internationally there are between 16 and 19 million nurses according to estimates by the International Council of Nurses. We are the backbone of the public health and disability system. We nurses are everywhere, in patient’s homes, general practice, clinics, hospitals, prisons, community homes, residential care, education, research units, management and leadership, policy development and regulation. This is a major step forward. However results are yet to be evident. Additional funding of $2.8m per annum from this year was granted by the Minister of Health to fund an additional 200 places. The eligibility period was increased from one year to two years. This firmly remains on our horizon with a goal of 100 percent funded places by 2018. We got behind, supported and were involved in the proposal by Auckland University for a funded nurse practitioner education programme linked to employment. It took a long time for this to work its way through the bureaucracy of Ministry of Health and Health Workforce New Zealand. Eventually funding was granted for a programme to commence in March 2016. Auckland and Massey universities will run this programme. We supported the Nursing Council’s application for nurse prescribing. This is important as an enabler for us to work at the top of our scopes of practice; which in time will result in an increase to access to nurse-led services for vulnerable populations and those with long-term health conditions. Working with the Fiona Unac, Chair of the Perioperative Nurses College we saw Auckland University endorse a new Certificate of Proficiency for Registered Nurse Assistant to the Anaesthetist. The work by the Enrolled Nurses Section to develop a dedicated Supported Entry to Practice Programme was completed. Now the challenge that lies ahead is to advocate and lobby for this to be funded. Lastly we successfully got onto the Governance Group for the Kaiāwhina Workforce Action Plan. This was in response to concerns raised by the Enrolled Nurses Section. We argued that the Kaiāwhina workforce is a continuum of the nursing team, and that it is important that the action plan be developed within that context. This will remain a challenge but we will continue to influence, advocate and lobby. Workforce development is complex with multiple strands to which we need to be tuned into all the time. There is no ‘one size fits all’ and our messages on these areas going forward need to be targeted at getting results for you. Improving organisational health is controversial and a challenging philosophical concept. From a financial perspective we are making in-roads into recovering financial losses from the past. We ended the year with a positive financial result which David will present to you later. The Board has worked hard with me and the Management Team to tackle a few areas to manage costs. We should always be mindful and keep an eye on our financial reserve and not to use them to support organisational operational structures. Alarm bells should ring if we head in that direction. Professional Nurse Advisors, an increase from 7.7 FTEs to 9.1 FTEs with a focus on Hamilton and Christchurch. These organisational growth areas are in response to our commitment to get to member issues quickly. Fellow colleagues from time to time you will hear all sorts from people about what is happening within the organisation. I will stress to you that you need context and background to know what is going on and sometimes what you hear may not be correct and other times it may be. It pays to contact me directly on operational matters. My assessment is that NZNO has done well during the past year. Some of you may say not enough in some areas, and I acknowledge that. We can never do enough! I would like to place on record my sincere appreciation of the work you have done in the past year and will continue to do this year, the work done on your behalf by our staff and the support of the Board and Management Team. “What we do comes with its own challenges and tensions but let us remember and work together as united we stand, divided we fall. We are one profession with many roles and voices, we are a collective and together we can continue to make a massive influence. 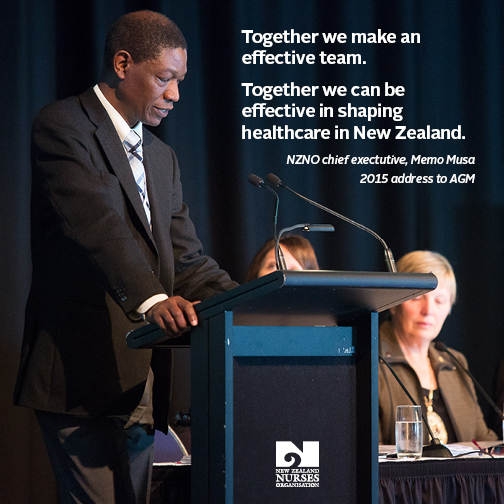 Together we make an effective team.” Together we can be effective in shaping healthcare in New Zealand. Lastly but not least I would to thank all our exhibitors and sponsors at this AGM and conference tomorrow. I hope you enjoy the AGM and conference and that you get the best networking opportunities, so you can take away important ideas to innovate and to champion for changes in whatever health setting you work within. Tags: advocacy, collective action, conference, funding, health politics, nursing, NZNO, workforce planning | Permalink. Together we are stronger: some reflections on DHB MECA bargaining. Lesley Harry is the industrial adviser for the DHB sector and has been leading the NZNO negotiation team in bargaining with the DHBs. 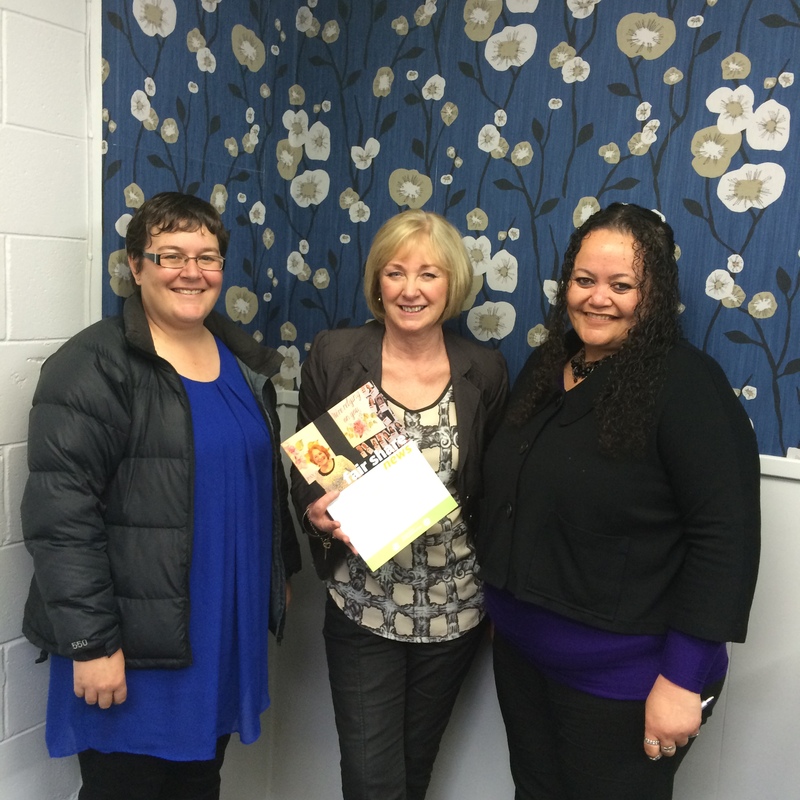 Lesley is a longtime activist who works tirelessly for a better working life for NZNO members. Since the end of last year, NZNO has been in a time of incredible busyness and energy, because of the collective agreement negotiations between 26,000 members and DHBs. Collective bargaining can be the best of times and (sometimes) the worst of times for unions and union members. It can be disappointing when the employer doesn’t recognise the worth of their workers, or when the discussions get stuck, and it can be hard waiting for news when we don’t know what will happen or when. On the other hand, it has been totally exciting to see the outpouring of collective creative energy of our members on action days and at worksite meetings. NZNO members are skilled bakers and costumists, artists, photographers, organisers, decorators, activists and speakers, and are also hilarious! We see the best of you all in your collective actions and displays of strength and solidarity – and it’s slightly overwhelming when we see letters flooding back in to realise just how many of you there are! This incredible energy has had a solid impact so far. When the first offer was taken out for DHB members to vote on, there was a resounding ‘no’, followed up by direct action. The DHBs and NZNO were coming from very different positions, standing far apart. Since then our negotiating team has made progress in mediation, buoyed by your support. You can be absolutely sure the DHBs take note of our action. The progress we made would not have happened without it. It’s also interesting to note that the further through bargaining we have gone the more conversations have opened up about the bigger picture. Government funding of DHBs affects what services can be provided, and the wellbeing of both staff and patients. In essence, NZNO and DHBs want the same thing: to protect our precious health services and create sustainable work environments that are safe for everyone. NZNO members are a very powerful resource in the fight against health sector cuts. DHBs might just be starting to see that they are stronger standing together with us too. This is what the power of our solidarity can achieve. We are looking forward to hearing more news from the DHBs next week and gathering together again in huge numbers- hopefully at ratification meetings! Tags: collective action, DHB, DHB MECA, funding, MECA | Permalink.